Make easy payments with Square Installments. Subject to credit approval. A true detailing art that takes years of practice to master. True paint correction is not something that can be performed in a few hours. We have spent years not only mastering the techniques; but the science behind the materials, tools, and paint systems used by car manufacturers and bodyshops to guarantee you the finest outcome! Remove scratches, bumper scuffs, repair paint chips and restore gloss to your paint!  Removes light to medium scratches and restores a deep gloss & shine. Thorough wash and multi-step paint decontamination to rid all exterior surfaces of embedded particles, bugs, tar, etc. Wheels (faces & barrels) deep cleaned to remove all dirt and brake dust. 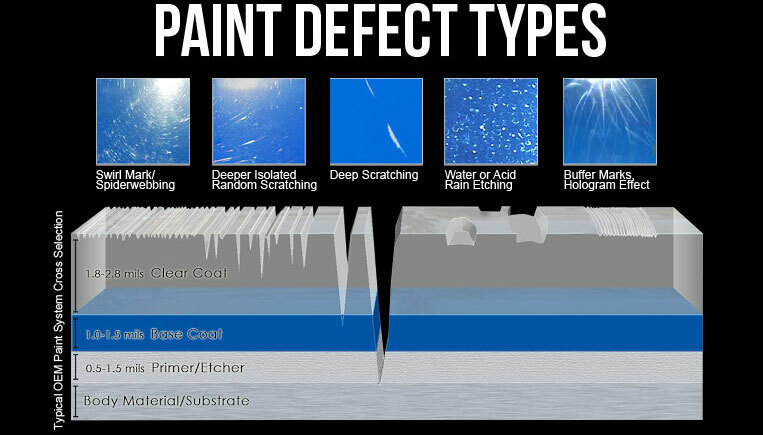 Paint thickness readings are taken on multiple location on each panel to identify any potential refinished areas as well as areas where it is not safe to polish due to the lack of paint in that area. Trim, badging, and other sensitive areas are taped off for protection during the polishing process. One step paint correction to remove swirling, light to medium scratching, and water spots while boosting gloss and clarity. Paint surfaced is then cleaned to ensure proper results. No fillers here! Long Lasting sealant applied to paint/glass/wheel faces. The sealant we use is superior to any wax on the market. It provides superior gloss, chemical resistance, and water behaviour along with lasting far longer than traditional wax. No upcharge here; this is standard with our full paint correction service.  Removes medium to deep scratches & defects. Restores a virtually perfect reflection & breathtaking gloss. Two step paint correction. The compounding step removes heavy scratches and defects. The polishing step then refines; leaving a swirl free and head turning shine.  Protect your new restored paint for years with our professional car coatings.  Never wax your car again. With over 16 years of experience in paint correction techniques along with the best tools available; rest assured that you will receive superior results not available anywhere else. Paint Correction consists of three main services. These services are buffing/polishing, scratch & chip repair, and wet sanding. Paint correction removes paint blemishes such as scratches, swirling, oxidation, and environmental etching from bumper, hood and all painted panels. All without going to the bodyshop! Copyright © Carolina's Finest Detailing 2018. ⚡️Powered by Detailing Boost. Sitemap.